b2evolution 2.3.0-rc1 “Renaissance” has been released. This version brings more than bug fixes over the 2.2-beta. You will also find new widgets, more customization options, a better WordPress importer, a 2.0 version of the Miami Blue skin and – by popular demand – more SEO presets! In addition to Aaron Wall and Stephan Spencer, this version now includes search engine friendly presets recommended by Andy Beal (Marketing Pilgrim), Michael Gray (Graywolf) and Rand Fishkin (SEOmoz). Modular templating of comments makes it easier to customize comment display without going through PHP code. WordPress compatibility layer makes it easier to port WP themes to b2evo skins. Miami Blue skin ported to 2.x and included. Additional presets by Andy Beal, Rand Fishkin and Michael Gray. Better out-of-the-box experience including Blog A being pre-assigned as default. 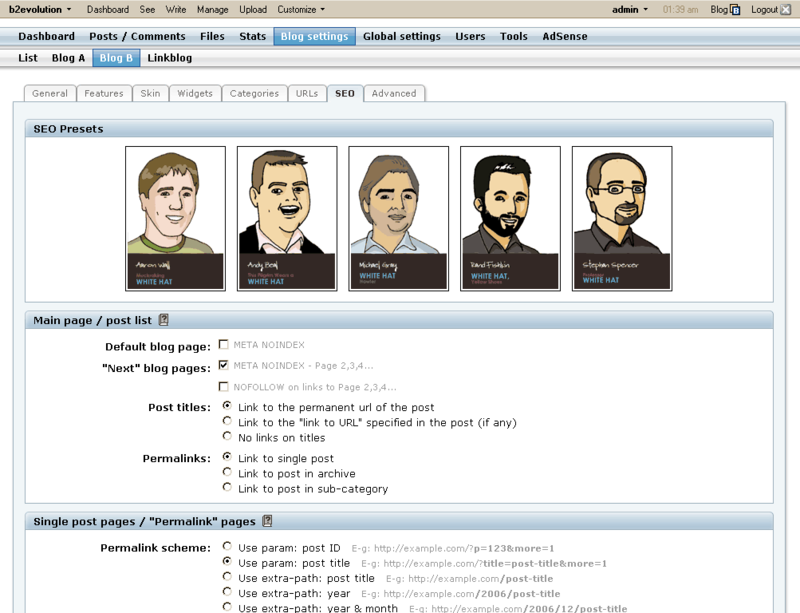 Blogroll added by default to blog A & B. Is there a place where the SEO presets are discussed? Generally I like the idea, but when there is too much choice, it becomes difficult to choose. I too, I installed the new files on my 2.2 installation with custom skin. And - of course - it looks just as I expected. Thanks for all the work François, Daniel, ¥åßßå, and other secret dwarfs. And an editor like FCKeditor or TinyMCE with a good integration in b2evolution (Word code and More)? What about ugrading form 1.10.3 to 2.3.0? Is it supported? Fantastic features. Looking forward to installing this version! Does anyone know if Windows Live Writer works with b2evo 2.3.0? It works fine, Daniel and Francois, and I’m playing with the newe features, updating my skins for the last time ;-) and I like all the Container-Stuff very much! Well, I haven’t checked into it, but this time it all went smooth - thanks a million for all the work you put into this :)!! Wow nice 2008 New Year gift! I am declaring 2008 the FLOSS Year! I am registered with Bluehost and trying to download b2evolution 2.3.0-rc1 “Renaissance” but when I click on “Download here >>” it keeps bouncing me between home and the download tabs. Am I missing something? I’m gettin’ a wee bit dizzy. Advice Welcome. Thanks. Gail, you need to click on the file size in the “download” column. I’m running 2.2.0 and I’m looking forward to 2.3.0. I have changed from 2.0.2 to 2.3.0 and the update was very easy. I have had some Problems with my skin, but I have fixed and now it works fine for me. Thanks for your great work. wow, excited about the new release!!! I love the new skin system. Can I upgrade from 1.10.3 or I am going to have trouble ? Yes, again, upgrading from 1.10.3 as well as ANY PRIOR version of b2evo is fully supported. If you are using a default/standard skin it’s a piece of cake. Same if you plan on using a skin from the 2.x skin directory. If you are using a customized skin, you will have to convert it which may take a couple of hours. New skins (from versions 2.0 and up) need NO upgrading to work on 2.3. We upgraded. It took us 20 minutes or so but that’s related more to downloading/uploading the new files than the actually install. Can this be use on My SQL Server 5.0? Yes it works with MySQL 3.23, 4.x and 5.x. Hi & thanks for a great product. I ugraded to 2.3.0 a few days ago and to my sadness the Guadalupe skin was not there. Do you have any plans of updating that one as well? As it was many years since I did programming and have no experience with php files it is rather tricky to decypher how one should do. I understand people seems to think it is much better now in 2.3 but I still find it quite hard…. Even though the documentation tries to tell me how to go ahead it is quite an up-hill. Is there hope for help? Is it easy or can I upgrade from an older version? I think i have 1.10.3? I would be willing to pay for it if It’s a big problem. OK, so I need to copy/paste again? What happened to my ability to go directly from the comment list to the antispam page with the URL pre-filled? Could you refer me to a link that talks about how to upgrade skins? I use a custom skin and I’m still on a 0.9 version of b2evo but planning to upgrade in coming days.